The NetTESTER family, is a powerful & versatile embedded Ethernet Network Performance tester, operating at up to 10Gbps. The NetTESTER products are typically deployed, at network connection points, either by the Enterprise customers of Wide-Area Network Service Providers, or by Service Providers themselves, for verification of the performance characteristics of Carrier services. The NetTESTER is a device installed normally either in-line between the Carrier's termination device and the Enterprise LAN, or on a free port of the Enterprise Switch or Router. As an 'always-on' device, the NetTESTER platform is ready to be accessed on demand, locally or remotely, for testing purposes as and when required. Operating with both Layer-2 and Layer-3 addressing, the NetTESTER contains custom hardware for the generation of test traffic, loop-back (by packet-level Source/Destination address swapping) and analysis, to Industry-standard test profiles including RFC 2544 and ITU-T Y.1564. Users can access the NetTESTER either via a local terminal or PC, or remotely across the network via Telnet/SSH or Web Browser, to con gure any unit as either a test traffic generator or line-rate loop-back point for Ethernet MAC or IP addressed test packets. Output can be viewed 'live' or automatically transmitted, on test completion, as a report via TFTP to a remote console. Optionally, the NetTESTER can be configured to operate whilst the network is 'in-service', providing real-time monitoring of jitter and latency between other points in the network via the use of ITU-TY.1731 (for Layer-2 traf c) or TWAMP ('Two-way Active Measurement Protocol', for Layer-3 traffic). SNMP 'Trap' alarms are issued to one or more Management stations should pre-defined 'Service Level Agreement' criteria fail to be met. Since Ethernet is inherently non-deterministic, monitoring and management of actual performance levels, particularly latency and jitter which are critical to modern VoIP and Video applications, is a real challenge when compared with earlier generation connection-oriented PDH/SDH infrastructures. 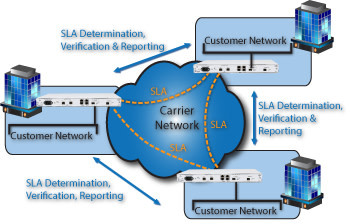 Particularly in the case of multi-carrier networks, it is difficult for the Enterprise IT team to know whether they are 'getting what they are paying for' in terms of de ned 'Service Level Agreement' (SLA) for key network characteristics including throughput, packet-loss, latency and jitter. By deploying one of Metrodata's NetTESTER devices, standard tests such as RFC2544 and/or ITU-T Y.1564 can be instigated at any time between different segments of the WAN, with the results monitored remotely at the Network Operations Centre (NOC). 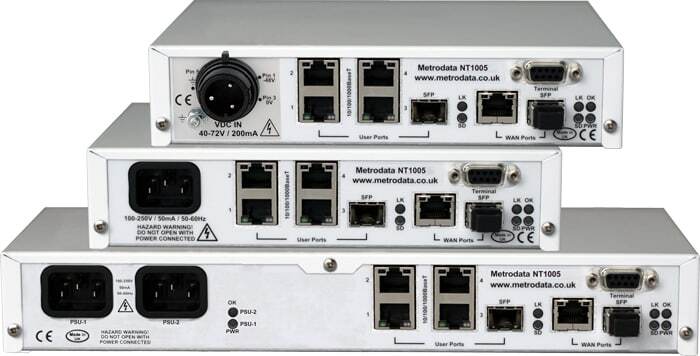 The NT10G05 generates both Layer-2 (Ethernet MAC addressed) and/or Layer-3 (IP) test traffic and can also perform line-rate Source/Destination Address swapping loop-back, via Metrodata's custom 'MetroSAM' (Service Assurance Module) hardware. Optionally, by integrating the NetTESTER more closely into the network, using the ITU-T Y.1731 and/or TWAMP protocols, test units can be configured to provide background monitoring of network performance relative to pre-defined SLA criteria, providing alarms to the NOC in the table-event of a breach of contracted performance from one or more network. Please Contact Metrodata for price and availability of SFP+ interface modules. The ever-increasing capacity, complexity and criticality of Enterprise Networks is providing a challenge to IT staff. Enterprise networks may include links provided by different WAN Carriers and tail-SLA Determination, Verification & Reporting Customer Network SLA Determination, Verification & Reporting circuit providers. For high-capacity networks, Ethernet is the physical connection medium of choice, with WAN services most commonly provisioned via Layer-2 or Layer-3 Virtual Private Networks (VPNs). Since Ethernet is inherently non-deterministic, monitoring and management of actual performance levels, particularly latency and jitter which are critical to modern VoIP and Video applications, is a real challenge when compared with earlier generation connection-oriented PDH/SDH infrastructures. Particularly in the case of multi-carrier networks, it is difficult for the Enterprise IT team to know whether they are 'getting what they are paying for' in terms of defined 'Service Level Agreement' (SLA) for key network characteristics including throughput, packet-loss, latency and jitter. By deploying Metrodata's NetTESTER family, standard tests such as RFC2544 and/or ITU-T Y.1564 can be instigated at any time between different segments of the WAN, with the results monitored remotely at the Network Operations Centre (NOC). The NetTESTER generates both Layer-2 (Ethernet MAC addressed) and/or Layer-3 (IP) test traffic and can also perform line-rate Source/Destination Address swapping loop-back, via Metrodata's custom 'MetroSAM' (Service Assurance Module) hardware. Optionally, by integrating the NetTESTER more closely into the network, using the ITU-T Y.1731 and/or TWAMP protocols, test units can be configured to provide background monitoring of network performance relative to pre-defined SLA criteria, providing alarms to the NOC in the event of a breach of contracted performance from one or more Network Carriers. 'Y.1564' circuit activation testing can be conducted to any remote branch location, independently of other links which may be running live data. Testing verifies that 'Committed Information Rate' is being achieved and reports Latency, Jitter and potentially Packet-loss Ratio for the new link, whilst regular traffic to other sites is running through the HQ link. 'RFC2544' profile testing could alternatively be used for individual Pointt-to-Point links. The NetTESTER can provide 'background' TWAMP monitoring that can be used to generate alarms to the Network Operations Centre in the event that (Latency, Jitter, Packet-Loss) becomes out-of-specification and breaches pre-defined 'Service Level Agreements' for each link. If you require further information on the NetTESTER product range please contact our sales team. Many other transceivers are available on request including long haul, 1550nm, CWDM, DWDM and bi-directional. Whilst the MetroCONNECT product range uses industry standard user exchangeable SFP and SFP+ transceivers, it is recommended that these are purchased from Metrodata to guarantee their specification and compatibility with each other. If you require another transceiver please contact our sales team with your requirements.